Your child can encounter any number of normal, day-to-day injuries while participating in recreational activities. As a parent in Stuart, it is important to know the signs of a sprain and when you should take your child to see an orthopaedic specialist. In order to help ease the initial questions after an injury has occurred, here are the three things you need to know when your child has a sprain. Some signs that a sprain has occurred are bruising, swelling and/or difficulty moving the injured joint. Depending on the severity of the sprain, the body part may show immediate signs of injury or it may not appear until hours later. 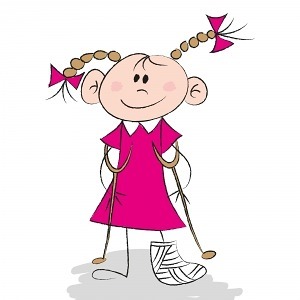 Sprains are cause by overstretching or tearing ligaments, so even if you suspect it is a less serious injury, use the RICE (rest, ice, compression, elevation) method while you care for your child prior to visiting your specialist. This widely approved technique will help limit movement and reduce swelling on the injured body part. Follow each step to ease your child’s discomfort before taking any further medical action. Rest. Stop your child from participating in physical activity. Rest and protect the injured or sore area to stop any reoccurring pain. Ice. Cold temperatures are very effective in reducing pain and swelling. Apply a cold ice pack for 10 to 20 minutes, 3 or more times a day. Do not apply ice directly on the skin. Place a towel before applying ice packs or frozen peas on the affected joint for 48 to 72 hours until the swelling is gone. Compression. Use the most common form of compression such as an elastic bandage to the injured or sore area. Be careful not to wrap too tightly as it can block circulation and cause more swelling around the affected area. If swelling isn’t reduced after 48 to 72 hours of compression, consult your health care specialist, as it could indicate a more serious injury. Elevation. For the lower extremity injuries such as knees or ankles, make sure to keep the limb elevated at or above level of your child’s heart to help minimize swelling. Grade 1 is a mild sprain where ligaments stretch slightly producing minor soreness and a bit of swelling. Grade 2 is a moderate sprain with partial ligaments tears. It will feel painful and may stay swollen for a while. Applying weight or pressure to the body part can be difficult. Grade 3 is the most severe type of sprain. The ligament tears completely leaving your child with very painful swelling and unsteady movement. Weight bearing or applying pressure to the joint may not be tolerable. A visit to the doctor is recommended and following X-rays, a cast or splint may be applied to heal the injury. Instruct them to warm up and use recommended stretching techniques before engaging in physical activity. Mind their steps. Teach your child to use caution on any uneven or cracked surfaces. Purchase proper fitting shoes that will grip your child’s ankle to reduce slips and unwanted movement within the shoe. Give them a break. If your child is tired or fatigued it can increase their chances of getting injured, especially if they have previous sprains and strains. Bumps and bruises are parts of growing up, so learn to recognize the signs and your children will recover as soon as possible.